Dubai, UAE, January 29, 2019: The UAE National Girls’ Team A have increased their lead at the top of the points table with a 2-1 win over second-placed Du LaLiga HPC Girls in Week 9 of the Dubai Sports Council Football Academies Championship. The win allowed UAE National Girls’ Team A to maintain their unbeaten record in the Girls’ Under 18 category and take their tally to 15 points from five games, while Du LaLiga HPC Girls remain on 9 points. The UAE National Girls’ Team B, without a win since their 1-0 triumph over FC Academy Just Play in Week 4, ended their drought with a convincing 3-0 triumph over the same opponents, who are still searching for their first point. In the Boys’ U18 action, du LaLiga HPC have moved to the top of the Group A table following their 3–0 win over Alliance Academy. They now boast an all-win record with 21 points from seven games. City FC also have 21 points, but they have played a game more. In other matches of the division, Abu Dhabi Elite defeated Barca Academy Dubai 7-1, while Spanish Soccer Schools Iniesta split points with LaLiga Academy following a thrilling 2-2 draw. In the U16 division, City FC Red edged Go-Pro 1-0 to keep their top spot in Group A with 23 points, but du LaLiga HPC are only one behind following their emphatic 8–0 over FC Academy. Al Wasl Academy defeated FSC Foxes 2-1, while Shabab Al Ahli Dubai shared the honours with Spanish Soccer Schools Iniesta following a 1-1 draw. 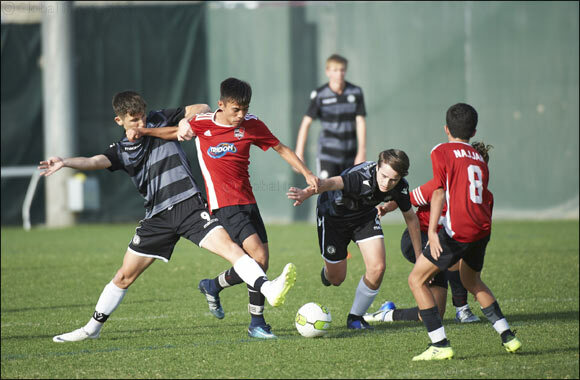 At Dubai Sports City in the U14 division, Al Wasl Academy drubbed Alliance Academy 6–0 to climb to second position in Group B with 24 points, three points behind top-placed Spanish Soccer Schools Ramos. The Dubai Sports Council Academies Championship is the largest tournament of its kind and this year, it has expanded to include 100 teams and 2,300 players from private and local club academies. The matches are played at the finest facilities in Dubai including Al Wasl Club, Shabab Al Ahli Club and Dubai Sports City Stadiums. The Championship runs from October 20, 2018 to April 27, 2019.